There are four route planners I've used for planning trips in our Chevy Bolt. I've reported on my experience with EV Trip Planner, Green Race, and Chevy's own Energy Assist App. The first two are found on the web, the latter is available only as a smart phone app. The fourth is boldly titled A Better Routeplanner (ABRP) and it too is available with a web interface. They all work to a degree. The question is--for us non-Tesla drivers--what works best. We were planning a trip to Death Valley National Park and like our trip to Yosemite from Bakersfield the trip is outside the range of the Bolt's 60 kWh battery pack. After I lamented on a forum that Green Race is no longer available, a poster suggested I try ABRP. I hadn't been able to use ABRP before. When I first looked at it several months ago I couldn't get it to work for me. It felt clunky and the few estimates I could get it to project were off substantially from the other planners and my own experience. So I simply disregarded it. While I consider myself a nerd, I sometimes feel I am fast falling behind in my nerdom, especially in the EV world. Talking about EVs with fellow drivers and tracking EV performance has put my technical skills to the test. I remember how elated I was when I got my OBD reader to work with Leaf Spy on our 2015 Leaf. Torque Pro for the Bolt raised the challenge to a whole new level. At one point I just gave up. Several weeks later I tried again and was successful. (See Tracking Chevy Bolt EV Battery Capacity.) Use of ABRP as a route planner falls into this category for me--it has features I am not sure I know how to use. Nevertheless, I tried ABRP again. This time around I found the interface (version 3.5.2) easier to use--or at least easier for me to use. I then ran the numbers for our previous trips, comparing ABRP's performance with the other estimators. And I ran the numbers for our upcoming trip to Death Valley. The estimates by ABRP for Bakersfield to Ridgecrest via Weldon were consistent with Chevy's Energy Assist App and with our actual experience driving the Bolt: 56% charge remaining for a consumption of 26.4 kWh. The return, Ridgecrest to Bakersfield via Weldon, ABRP estimated 64% remaining or a consumption of 21.6 kWh. This was only slightly less than that estimated by the Chevy app and equivalent to our actual experience. 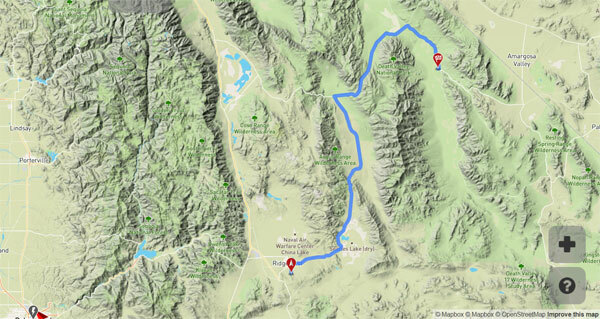 However, ABRP's estimates for the leg from Ridgecrest to Furnace Creek differed substantially from EV Trip Planner and Chevy's Energy Assist App. The difference--from 5 to 10 kWh--is enough to leave you stranded by the side a very desolate road well out of mobile phone range. It's an EV driver's nightmare. Initially, ABRP's map showed the first leg from Bakersfield to Weldon in red. What does that mean, I wondered? It's not explained on the help screen. In all the other routes I entered, none were in red. So I contacted the web site's creators. They quickly responded that the application determined I should drive below the posted speed limit on the red segment to reach my destination. To check the estimates driving at the posted speed limits, they said to go into settings and under maximum speed, uncheck a setting labeled "Slower if Needed." I did, and all the route segments then appeared in blue. This didn't change the estimate much at all. It reduced the capacity remaining after driving from Bakersfield to Furnace Creek by 1%. That still seemed to be too high. As a result, I decided to compare ABRP's estimates with some of our past trips in the Bolt to see how it stacks up to real-world performance and then compare the estimator to our actual experience driving to Death Valley. I've posted these trip summaries on a separate page. See EV Trip Planners and Trip Summaries with Chevy Bolt. Overall, ABRP's interface has a much more pleasing appearance than either EV Trip Planner or Green Race. ABRP uses OpenStreetMap and MapBox rather than the all pervasive Google Maps, but the mapping function was quick and generally accurate with some quirks. (Green Race ran into problems using Google Maps and is now defunct.) The map doesn't work the same way as Google Maps to reroute a trip. ABRP requires the user to type in waypoints or to click on a map segment to select a waypoint to redirect the route. (In Google Maps you can drag a route segment to where you want to go.) But once this quirk is mastered, ABRP's mapping interface is quick and easy to use. The entry of waypoint data was easier in ABRP than either Green Race or Chevy's Energy Assist app and ABRP was faster to suggest waypoints to select than either. ABRP's route map and the way it displays the route is much more visually appealing than EV Trip Planner. ABRP's default is a shaded topographic view versus that of the map view in EV Trip Planner. The topographic view is easier to digest than Google's satellite view that's available in EV Trip Planner. ABRP gives results only in the percentage of battery capacity remaining, not in kWh required. This function is similar to Chevy's Energy Assist, but it differs from EV Trip Planner and Green Race that report in kWh. This necessitates some calculation if, like me, what you're after is kWh needed for a particular trip segment. It would be helpful if ABRP's designers included the value for kWh used in the results overlay in addition to the capacity remaining. This shouldn't require much tweaking. As noted, when I first tried to use the planner, I had difficulty making it work for me. As I tried it again I continued to have issues and felt that ABRP's interface was sometimes glitchy. It was nowhere near as bad as Chevy's Energy Assist app, but the occasional glitches were confounding. For example, there's a "graph" function but I couldn't determine what it's used for. At first I thought it was the change in elevation along the route as in Green Race's elevation chart. This is a really useful feature of Green Race. (I've also found the PlugShare elevation chart useful as well.) After more use I determined that ABRP's graph displays how fast your charge declines along the route. Regular ABRP users will no doubt quickly point out how to use the graph function, but as a newby I was dumbfounded. If you click on a route segment, ABRP will show a graph of elevation and the remaining capacity at that point. 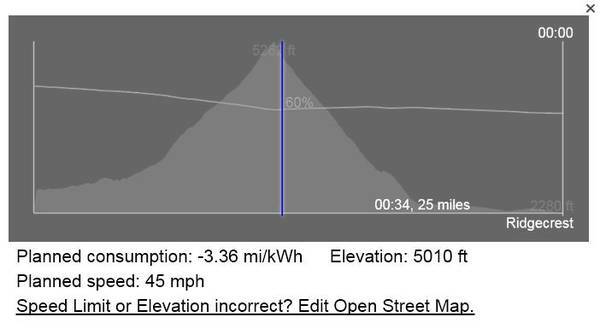 For example, I clicked on Walker Pass and ABRP shows a chart of the 5,300 foot summit with 60% battery capacity remaining, or 40% consumed at that point. This feature could be helpful in tracking your consumption on a long trip to see if your actual consumption follows the route plan. Eventually I stumbled on how this feature was intended to be used and therein was a lesson. The more I worked with ABRP, the better it worked for me. Each route planner has its limitations when mapping a route. For example, ABRP just couldn't map the preferred route to I-5 from the north side of Bakersfield. This is a very common route for people in Bakersfield. We wouldn't normally use it ourselves, but I had a meeting on the north side and it made sense to leave from the meeting for a trip to Santa Cruz via I-5. I suspect that what threw off ABRP is that the junction of 7th Standard Road with I-5 is not a standard cloverleaf. EV Trip Planner had no problem with this. It gave me this route on the first attempt. However, I gave up trying to get it right in ABRP. It wanted to take me south to a more conventional interchange. I tried a string of waypoints along the route and ABRP still failed to get me directly on I-5, adding nearly 10 miles in backtracking. In general I found ABRP as accurate, if not more so, than Chevy's Energy Assist, though ABRP wasn't consistently more accurate. At times ABRP was off by 10% or more from actual experience and from the Chevy app. I could not find any reason for the inconsistency between ABRP and the other estimators. I tried routes with freeway driving, and I tried routes with steep mountain roads. There didn't seem to be a pattern. None of my comparisons reassured me that ABRP's estimate of the capacity needed for a trip to Death Valley and return was more accurate than that of Chevy's app. So we decided to drive to Death Valley with a two-hour Level 2 charge stop in Ridgecrest at Alan and Marlies Kirk's. That would give us 10-14 kWh and bring us into Furnace Creek with 20% SOC remaining. We planned to repeat that on the return. There are no charge stations in Ridgecrest. In fact there are none till you get to Furnace Creek. Alan and Marlies Kirk are two of the few EV drivers in Ridgecrest. They are the only drivers to post their residential station to PlugShare. That's it until Furnace Creek, 120 miles of open desert, much without cell phone service. If you use ABRP with a cell phone and an OBD reader, you can Login in to ABRP with your cell phone. This allows ABRP to glean data from your OBD reader. ABRP then will show you your state-of-charge and calculate your reference consumption. This feature shares data anonymously with ABRP, which the designers then use to tweak the software. When everything is in sync--and working properly--ABRP will show a graphical representation of how well you're doing relative to the route plan. I couldn't get this to work for me, or it may have been that I couldn't easily interpret the results while I was driving. In either case, I wasn't able to take advantage of this feature on the trip to Death Valley. Others may be more successful getting this feature to work for them. To my knowledge, ABRP is the only estimator that has a forum where users can ask questions, comment, and make suggestions to the designers on how to improve the program. The program's designers participate in the forum, so you can correspond with the people who can adapt the software based on your feedback. I also found the designers, especially, Jason Rapp, responsive to my queries when something didn't work the way I thought it should. Rapp had to hold my hand a few times to get the Drive and Follow-up feature functioning. I've given up on using the Chevy app. It's just too unreliable. It worked well for a while. Now it works sometimes, but mostly it doesn't. Green Race is out. EV Trip Planner still doesn't include a model for the Chevy Bolt and it hasn't seen any improvements since its designer went off to study at Stanford. That leaves A Better Routeplanner. For those of us not driving a Tesla with its internal mapping features, ABRP is--as it claims--a better route planner and has become my go to choice for route planning. Oh, that trip to Death Valley? ABRP was right after all, beating out EV Trip Planner and Chevy's Energy Assist app. We could have made it the entire distance on one charge with about 6 kWh to spare, certainly more than enough for Eric "1%" Way of News Coulomb fame.